I have two go-to cookbooks when I’m in the mood to bake cookies: Great Cookies by Carole Walter and Martha Stewart’s Cookies: The Very Best Treats To Bake And Share by Martha Stewart. 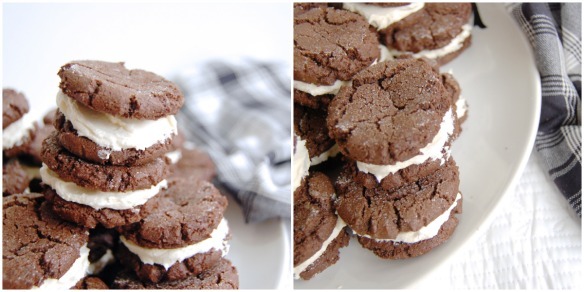 Both are fantastic compendiums of tried and true cookie recipes. 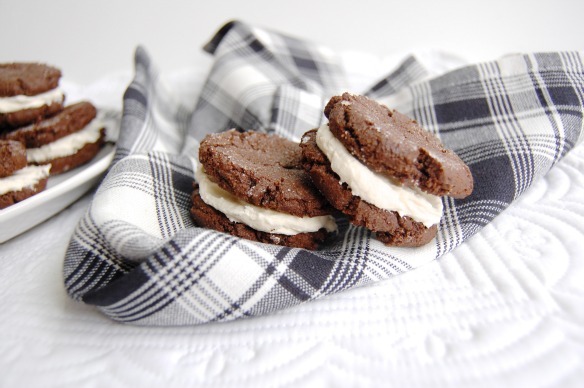 Cream-Filled Chocolate Sandwiches come from Martha Stewart’s Cookies. I absolutely love the table of contents in this book! It’s organized by type of cookie (light and delicate, soft and chewy…) and has a photo of each cookie. When you’re in the cookie baking mood, it’s so fun to flip through the first couple pages and let a photo jump out at you. That’s what happened a couple weeks ago when I was looking for a dessert to bring for a dinner gathering with new friends. 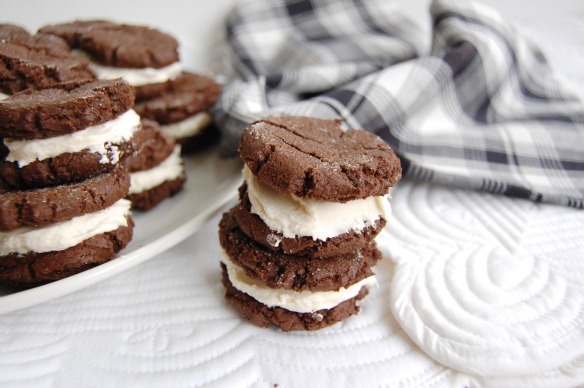 These sandwiches are the perfect balance between chocolate and vanilla, cookie and cream. Despite they layers, they are low maintenance to throw together. 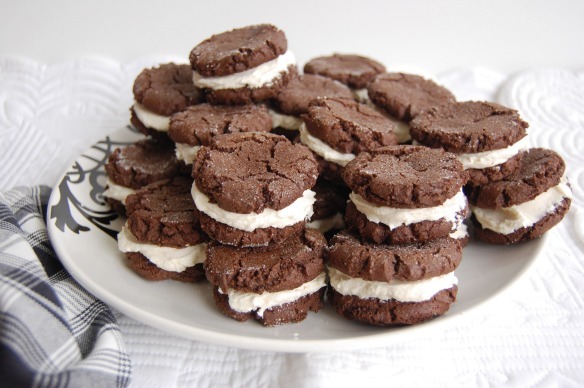 They taste like a more complex Oreo cookie: a smooth, vanilla infused cream sandwiched between thick, chewy chocolate cookie. 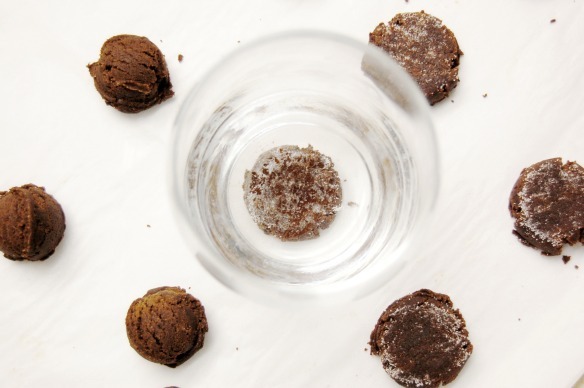 A sugar coating gives the baked chocolate cookies great textural interest and a little extra sweetness (not that these cookies need help in that department…). 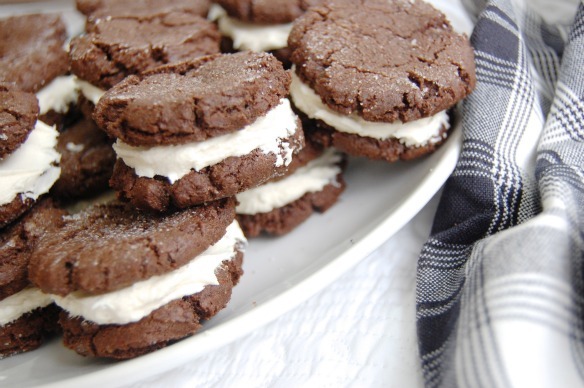 The cream filling is pure, decadent, and creamy – no slippery aftertaste. Just butter, shortening, vanilla, and powdered sugar whipped together. When you bite into one of these cookies, some of the filling will squish out and its just glorious. I would absolutely eat the chocolate cookie as is, but they positively ask for a filling. 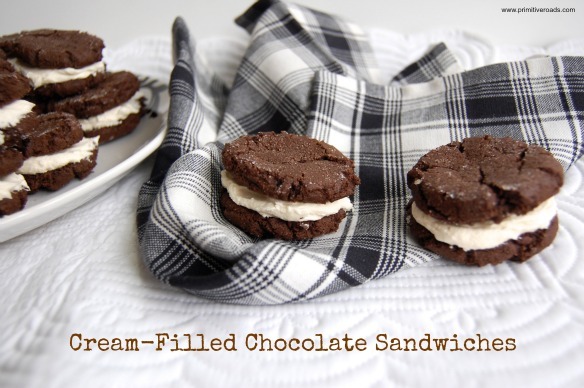 The cream is a traditional compliment, but I imagine they’d be delicious with a peanut butter cream or your favorite preserves in the middle. 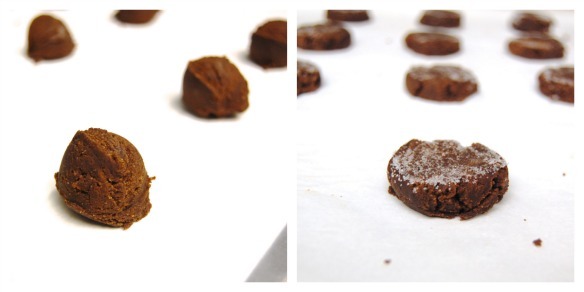 To vary the flavor, roll the sides of filled cookies in crushed candy cane, sprinkles, or mini chocolate chips. The dough can be made ahead and chilled in the fridge for up to one week or in the freezer for one month. Thaw completely before proceeding with recipe. Preheat oven to 375 degrees F. In a bowl, whisk together flour, cocoa powder, baking soda, baking powder, and salt. In the bowl of an electric mixer, cream sugar and butter until light and fluffy, about 2 minutes. Add egg; beat to combine. With mixer on low speed, gradually add flour mixture, continue beating until dough is well combined. Transfer to oven and bake until cookies are firm, 10-12 minutes, rotating sheets halfway through. Transfer baking sheets to wire racks to cool completely. Place cream filling in a pastry bag fitted with a coupler, and pipe about 1 tablespoon filling onto the flat side of half the cookies. (I did this with an off-set spatula.) Place remaining cookies on top, and gently press on each to squeeze filling to edges. 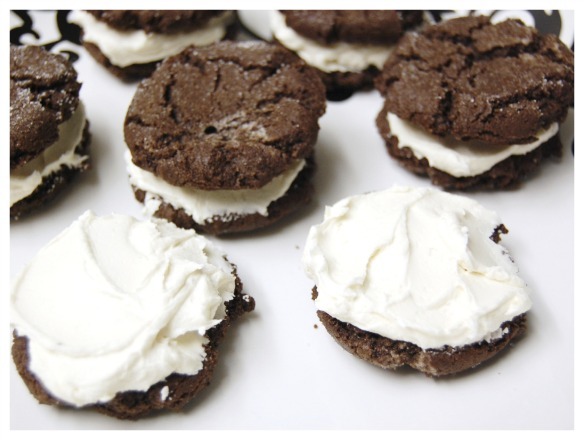 Filled cookies can be stored in an airtight container at room temperature up to 2 days. With an electric mixer, cream butter and shortening until well combined. On low speed, gradually add confectioners’ sugar and continue beating until light and fluffy, about 2 minutes. Add vanilla and beat to combine. Set aside at room temperature until ready to use. My sister-in-law made them, dyed the frosting pink, and rolled in pink sprinkles. Looked so fun for Valentines Day. I’d imagine they’d be great rolled in chopped nuts, too! They are, Rosie! 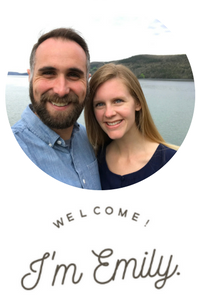 PS – your blog is lovely.